Popular Utah Whitewater Rafting Outfit adds new Custom, Charter and Private Group Trips for group sizes up to 19. Green River, Utah – November 1, 2012 – Well known Utah river rafting company, Holiday River Expeditions, is expanding its line of whitewater rafting trips to include flexible custom trips that people can share with friends and families. The new rafting trips range from one to six days and are suitable for kids as young as 8 years old. These white water rafting trips are open to groups like family reunions, wedding parties, church groups, clubs, organizations, senior classes or just about any group of friends or family who share a love of the beautiful outdoors. The group itself can together choose the trip they want to go on and depending on the month and trip can choose how many days they would like to be gone. Another feature that Holiday River Expeditions has just added is a new Tool Kit for Group Rafting Trip planning. The newly designed form provides trip participants with easy links to email, planning functions, and trip information sheets, all at your fingertips. These excellent resources make planning a Family Reunion Rafting Trip or a Boy Scout Rafting Trip both fun and easy. Most Holiday River trips are multi-generational, which means they are just as much fun for an 8-year old as for a 70 year old and just as safe. 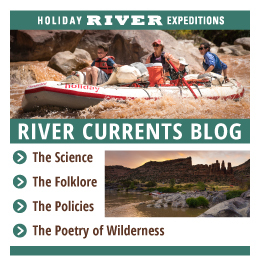 For over 40 years, Holiday River Expeditions has given adventure seekers unforgettable white water rafting trips down well known rivers like the Colorado and Green Rivers. Experience the thrill of mountain biking and white water rafting with your family and friends this year. Holiday River Expeditions offers white water rafting trips, and hiking and biking trips in Utah, Colorado and Idaho. These thrilling trips offer breathtaking scenery on the ride of your life through the Grand Canyon, Westwater Canyon, and Cataract Canyon among others. They also offer Family Rafting Trips, women’s rafting trips and birding trips.